History: Valkyrie was a top German pilot during WWII, leading a squadron of elite all female pilots known as the Air Maidens. 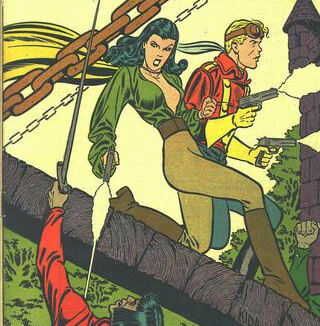 She crossed paths with Airboy many times, eventually switching sides along with the rest of the Air Maidens due to the heroic influence of Airboy. 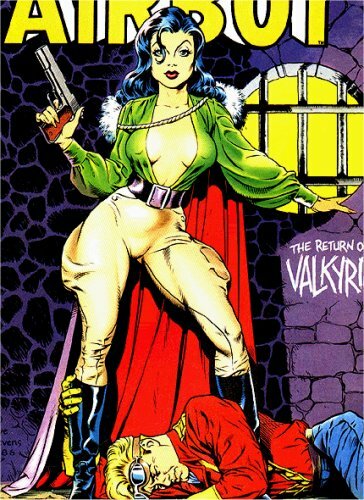 After the war Valkyrie was frozen by a spell for over three decades, going into suspended animation. She awoke to find her lover, Airboy, dead and his son the spitting image of his father. The two swiftly became allies. Comments: I was sent both of the excellent images of Valkyrie used on this page, but unfortunately can't recall who sent them to me to give them proper credit. If whoever sent them to me wants to remind me, I'll rectify this, and in the meantime, thanks anyway. 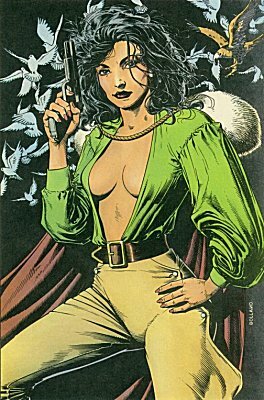 Valkyrie, several heroines in Marvel Comics.